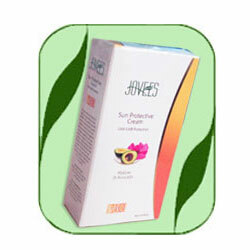 Buy Jovees Sun Protective Cream SPF-40. UVA/UVB Protection. Protects Skin from Sun Burns, Dryness & Premature Ageing, Sun Rays & Environment. Water Resistant Non Sticky Formulation. Nourishes Skin, Glow Skin. Free Worldwide Shipping. This natural Sun Protective daily use nourishing cream with SPF 40 is water resistant non sticky formulation, easily absorbed into the skin and helps protect the skin against damages caused by sun rays and environment. It contains precious herbal extracts and botanicals that shall also help protect the skin from sun burns, dryness and premature signs of ageing. It shall also help to bring glow to the skin. Apply daily in the morning all over face and neck and leave on. Mallow, Avocado, Carrot, Vera, Grape seeds, Jojoba, Micronized titanium dioxide, Zincum oxidum.